Today’s post will discuss the risk of consumer litigation for edible insect businesses. Edible insect producers could experience class action law suits or individual lawsuits. The plaintiffs would need to prove damages and prove causation of injury. The legal structure of your business will affect your liability. Top 4 concerns for consumer litigation related to edible insects. Physical hazards – For example, dry roasted whole cicadas can be a choking hazard. Legs/exoskeleton can get caught in ones throat. It would probably not cause full obstruction of the airway. Objects that are round and the same size of the airway are more likely to cause blockage. A stuck leg could cause other foods to get stuck also. See The American Academy of Pediatric Policy Statement on choking prevention. I feel a choking hazard warning is not needed. If a piece of insect gets trapped in ones throat and doesn’t go away then, I recommend that the consumer seeks medical attention to have it removed. Very annoying but not likely to cause long term harm. Asphyxia– Insect are a potential food allergen. More info on insect allergens. Antinutrients – Not well studied and would be difficult to prove harm. 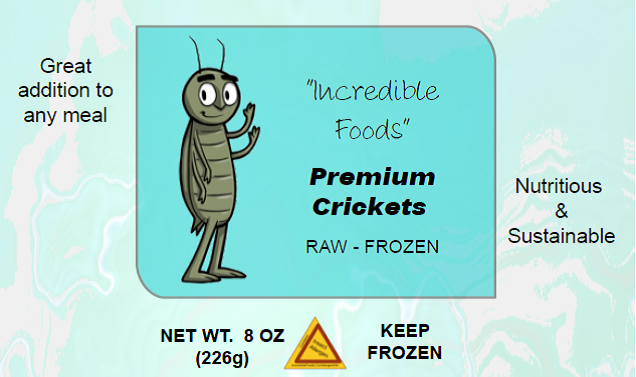 Animal welfare – We know that cricket can be cannibals if they don’t have enough space or food. How can we qualify that the crickets are being raised and harvested humanely? The best way companies can manage risk from consumer litigation is to use an allergen warning. Secondly, any claims must be supported with data and documentation. Did I miss anything? Should industry be using a choking hazard for whole orthoptera products? This entry was posted in Business, Regulations on August 1, 2015 by Bob.